On June 1941, the Germans invaded the Soviet Union. 2 weeks later on July, the Soviet first Western Front was on the verge of completely ceasing to exist. The Stavka committed virtually its entire strategic reserve to protect the Smolensk-Moscow axis. The Battle of Smolensk was critical and its outcome would determine if an offensive against Moscow could continue. Under your command the German Army Group Centre. This mission is in 2 parts. The first part puts emphasis on the German supply challenge, you have to protect the German supply depots and railway workers, and also defend against attacks from the Red Army and from the partisants. 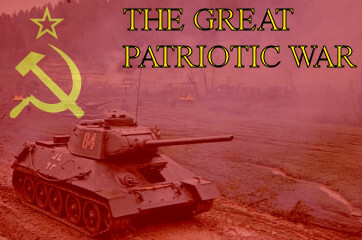 The second part is about the Battle of Smolensk itself. This mission will be included in the next patch Korona and friends will release soon! For a new project, based on Blitzkrieg 2, we are looking for a nickname for the first German Atomic Bomb. Provide an original name of the German Atomic Bomb before September 20 in the forums, and if it get's picked, you will win a copy of Dr Strangelove! For reference, the first American atomic bomb was called Gadget, and the first Soviet atomic bomb First Lightning. The contest has ended, we have a winner. Soon, you can play these missions, and replay the D-Day landings! The map simulates what was the largest and most costly offensive in human history. 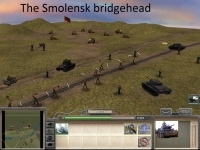 The player will control the Soviet forces and has to first halt and then later defeat the German invaders in several phases. 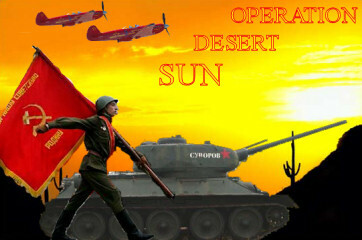 Welcome to Operation Desert Sun - Release day! After the British lost at El Alamein, the Russians send a strike force to the middle east. This force has come under constant attack and is close to defeat. Your orders are to go in and make sure that doesn't happen. Hereby we send you the operations plan described in several stages. You have been dispatched to the desert with a small relief force. Your first objective is to restore the battered soviet base. For the most part you start with only light tanks and infantry, however you also have 6 KV-1 main battle tanks, use their superior armor as a shield for other units. Once the base is restored, you will find yourself in a large desert with many towns and 3 main German bases. Do not under any circumstance launch an attack on those until you massed the appropriate forces described in stage 3. Your orders at this stage are to secure at least 4 towns, and occupy the flag buildings to get more resources. Note that in your base there are also 3 flag buildings. The Germans won't give up the towns lightly, they are defended by patrols and AT, and most likely a relief army will be send once you attack. The Germans will also periodically attempt to reconquer a town, so keep 1 reserve army of 10-15 tanks between every 2 towns. Next you need to make a larger army of 15-30 tanks to protect your occupied lands from major assaults by the Germans, which will come at regular intervals, however the point of origin will be unknown. Once you are able to build isu152 and su100's, build up a large army of 10-20 isu152, many t-34's, su76's and su100's, to strike at a German base. Use the isu152's in groups to smash enemy tank forces and blast apart defenses. The su100's excellent range will help you destroy heavy German tanks such as panthers and tigers. The rest of your force, su76's and t-34's, you can use as a meat shield. Do watch yourself general, minefields are reported near the German bases. 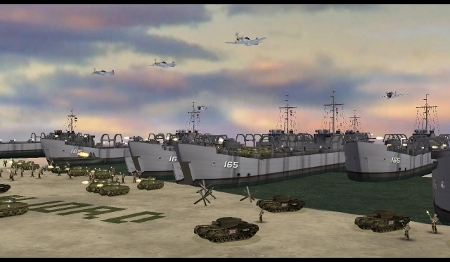 The objective is to take down all 3 German bases, their Command Centers and the Super Weapons. Once completed you will be victorious. The Germans have Super Weapons, and will use them. Reinforcements are delivered at your train station in regular intervals. Keep enough reserves to deal with German counters. This new standalone mission features a fictional desert war between the Soviets and the Germans. The player has to take on 3 German bases and conquer many towns. A random attack script deploying large scale German attacks. You never know where they will come from. A randomized base defense system featuring Air, Artillery and Ground forces. A town by town battle system in which the Germans send a team to reconquer a town and re-occupy it. A revolutionary air system in which the AI backs up the team under attack with Air Support. A Scoring system which will display the time it took you to complete the map, and the number of reinforcements delivered. 3 Types of German Super weapon. Estimated completion time: 90-120 minutes. Note, you probably can't save at the moment, the mission is not build into Blitz yet - it's not supported - so take the time to sit down. Also included in the .zip is the latest COOP mission, Axis-vs-Soviets, in which 3 Axis players take on a scripted Soviet Ai. A couple of weeks ago, I mentioned projects too cool to drop, but which took too long to be included in the last release of Blitzkrieg 2. Now I have the privilege to unveil another such project: a new site. The old site, dating back to 2003, was kind of outdated, and never included the original Blitzkrieg. Today, that changes. I hereby welcome you to the new Blitzkrieg website, the new home for both Blitzkrieg modifications: Blitzkrieg and Blitzkrieg 2: The Finest Hour. I won't bother you with too many details, just click through to new site itself! As you can see, the new site is (almost completely) in English, German and Russian. The few remaining spots will be filled in the coming weeks, but I would already like to say thank you to all our translators, who helped in this gargantuan task. Gambler, Raminator, Bastep, Reznichenko, Handbuerstel, Daniella, Jane and my Julia, thank you! Welcome to our new site, and enjoy playing Blitzkrieg. And for those who are waiting for a new release of the original Blitzkrieg: stay tuned!